I’ve eaten a lot this year. Let’s just get that out of the way at the start. 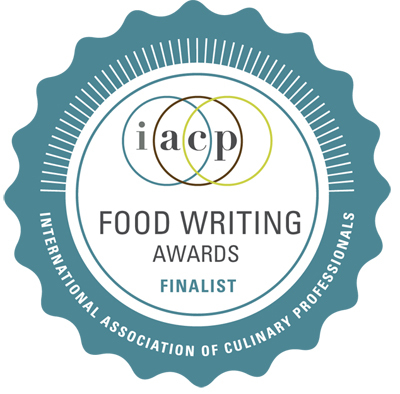 So, you can imagine my dilemma in coming up with a list of a mere 10 dishes or items that were my ultimate favorites this year. I limited the list to meals I ate out at restaurants, rather than made at home. They also had to be so great as to have me still longing for a taste even now. 1. 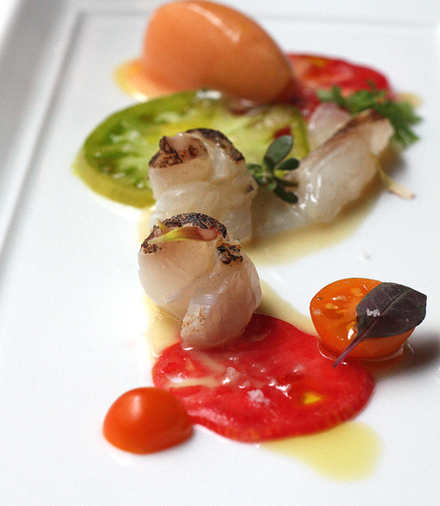 Thai snapper crudo with tomato salad and tomato sorbet at the Fifth Floor in San Francisco. Silky little coils of fish accompanied by a tiny scoop of sorbet that tasted like the best summer tomatoes taken to the nth degree. How can I ever forget that? I just hope I can experience it again in the future, as this dish was prepared by Chef Jennie Lorenzo during her last week at the restaurant. 2. The coconut donut at Dynamo Donuts in San Francisco. Yeah, yeah, yeah, the maple glazed bacon apple donut gets all the glory. And it is dang good. But any donut that turns me into a coconut lover is truly something. 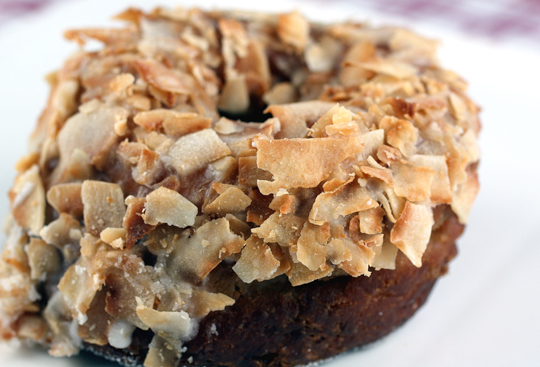 This donut definitely is that, what with its coconut glaze and coating of big shards of lovely toasted coconut. 3. 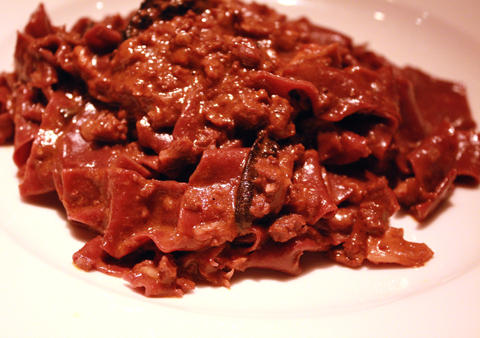 Papparadelle with pork heart and wild mushroom ragu at the “Whole Hog” event at Oliveto in Oakland. Words do not do it justice, nor does this photo. Earthy, meaty and extraordinary, this dish will make you “heart” pork heart. 4. Steamed pork buns at Spice Kit in San Francisco. David Chang may have cornered the East Coast with his Momofuku pork buns. But Will Pacio and Fred Tang have got it going on in the City. 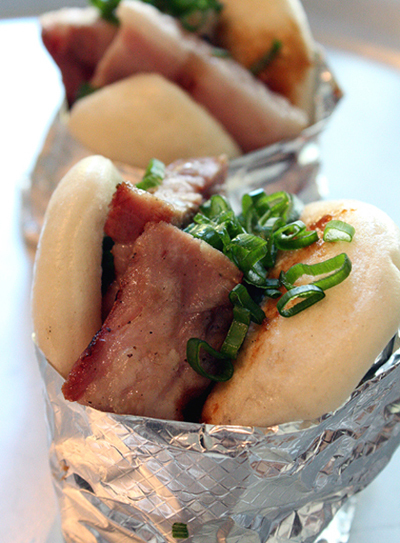 Their steamed white buns are fluffy and so fresh tasting, and filled with super juicy grilled pork belly, a smear of sweet hoisin sauce and crunchy pickled cucumbers. 5. 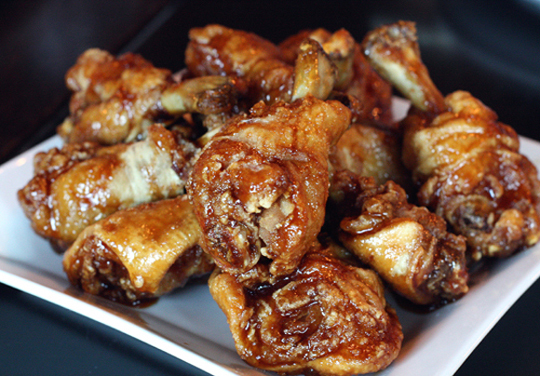 Adobo wings at Attic in San Mateo. Crispy and coated in a thick, tangy-sweet glaze, they’re worth the resulting messy fingers to eat them. I’m not even a big chicken-wing gal. But these I can never ever resist. 6. 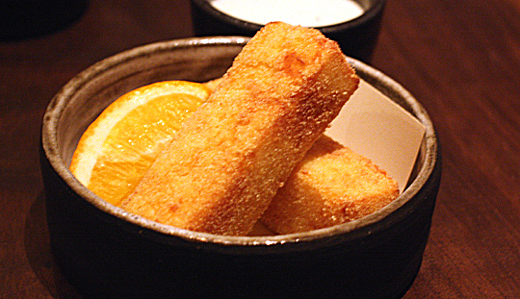 “Panisse frites” at Frances in San Francisco. I’ve had chickpea fries before and they’ve never been anything to write home about. But these? Thick and log-shaped, they are golden crisp on the outside and creamy-custardy within. 7. 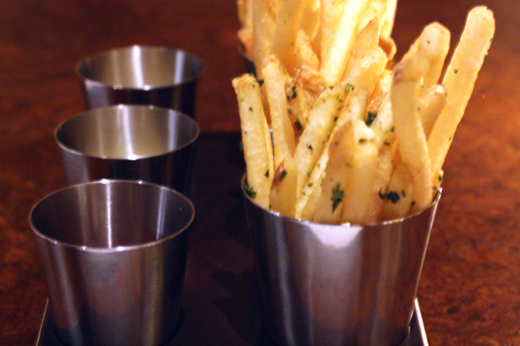 Trio of duck fat fries at Bourbon Steak in San Francisco. First of all, they’re free. Yup, every table gets these beauties after being seated. Second, they are brought to the table with great flourish — a trio of fries, each sprinkled with a different seasoning, and accompanied by three different dipping sauces (sour cherry ketchup, smoked onion aioli, and yuzu mayo). Trust me, you will eat every single fry. They are perfection. 8. 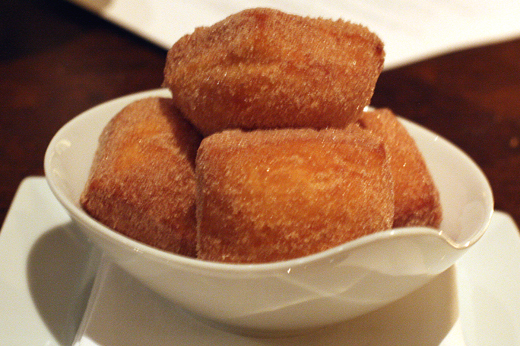 Cinnamon-sugar beignets at Bourbon Steak. 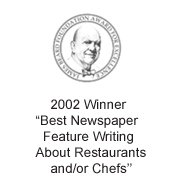 Yup, that restaurant scores a two-fer on the list. That’s just how good these are. They arrive at the table warm, with every inch coated in sandy cinnamon sugar. They’re substantial enough that they don’t deflate from the pressure of your fingers yet they are wonderfully airy and fluffy inside. 9. 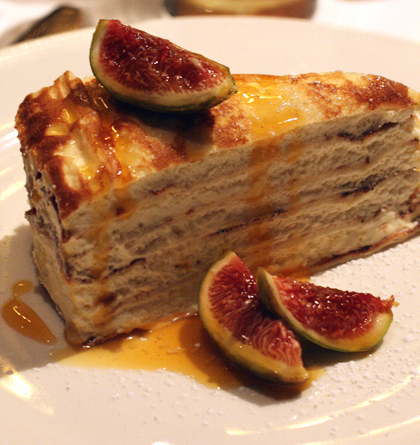 “24-layer crepe cake” at Cafe des Amis in San Francisco. OK, so it’s really only six crepes, not 24, stacked high with soft whipped cream in between. No matter. It’s soft, creamy and tres elegant. 10. 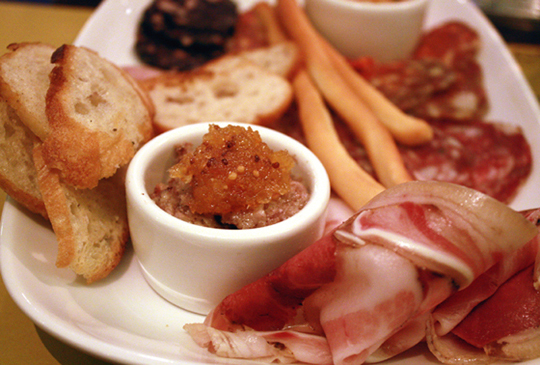 “Chef’s selection of salumi” at Barbacco in San Francisco. Put yourself in Chef Sarah Burchard’s hands and you won’t go wrong. After all, those were the hands that broke down whole pigs regularly when she was in charge of sister-restaurant Perbacco’s salumi program. The offerings here are outstanding — from the melt-in-your-mouth mortadella to the spicy, smoky, spreadable nduja. 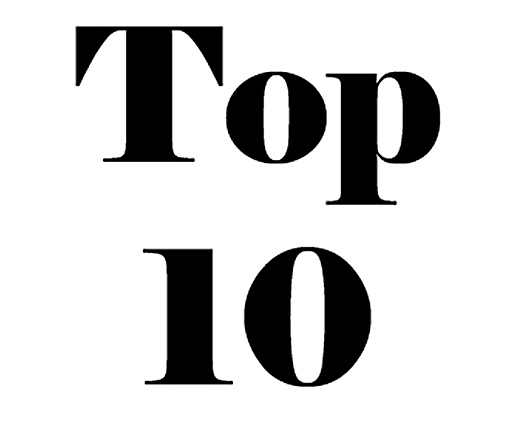 A great top ten! Those pork buns and that crêpe cake look irresistible. Looks and sounds absolutely delicious! 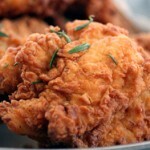 Can’t wait to see what you’ll be eating and cooking in 2011! Wishing you a happy, healthy, and delicious 2011! Your top 10 list is huge & marvellous food in here! I wish you & your man a Happy 2011 filled with joy, good health & good food! Great round up! Of course, I want to eat every single thing on this. Happy new year, food gal! Wow. A shut out for the South Bay! 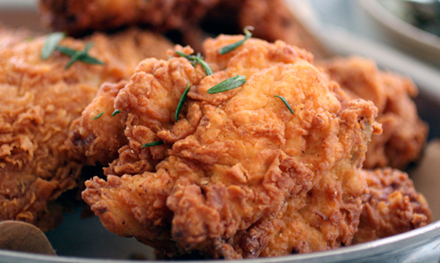 I’m so with you on those adobo wings and duck fat fries…and those beignets!!! I’m attempting my first shot at making Duck Confit and can’t wait to have some Duck Fat of my own to make fries with! Oooh, I think we should all head to Cookie’s house! Cookie, if you hear a bunch of people ringing your doorbell…. 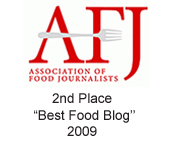 I’m salivating at this fantabulous roundup of eateries! Especially dying for those steamed pork buns…Like Moe R., I’m sorry not to see any South Bay mentions…I’m going to have to move to SF in 2011! Keep up the great work in the coming year, Food Gal! Carolyn, Sounds great and I haven’t even had supper yet…makes me hungry – Beignets are wonderful. I’ve had them at the Cafe’ de Monde in New Orleans with a great cup of coffee. Crepe cake is interesting. I’m just a gal with a sweet tooth. Busy making mini-cheesecakes -for an order..followed by eggnog from scratch, and homemade hot fudge sauce to go over ice cream. No calories here, we leave them all in the kitchen…which is great as long as you don’t eat in the kitchen. We’re waiting for snow in NW WI..SD and MN already have a blizzard going on. Have a Healthy, Happy and Safe New Year. Oh God, you’re killing me and I love it! Also…had dungeness for the second time this week today! Yum! Forget 7x7s top 100, this is the must have list for any self respecting food lover in SF I’m on it! I hope to try one of these some day. The steamed pork buns and adobo wings are alluring. Love the top 10, I was automatically drawn to the pork buns haha..I should have consulted your blog before my trip to San Francisco last year! Definitely a mouth-watering round-up! (I’m still yearning for that crepe cake! 🙂 ) Wishing you a very happy, healthy, and prosperous 2011! Whoa, its been a good year!! Hope 2011 is even more delicious! Those are some amazing eats for sure! Happy new year and best wishes in 2011! Any food truck meals in the running? I love this list! I especially like the idea of getting free duck fat fries at the beginning of a meal. Really??!! The first one sounds incredible too . . .